It's a sign of the iPhone's growing maturity as a platform that I can now have a favourite iOS developer. And that developer is PikPok. The New Zealand studio, who we've featured once or twice on Kotaku before, has just released another sports game, only this one is a little different from its previous efforts. This one is less like NBA Jam, and a lot more like Space Jam. 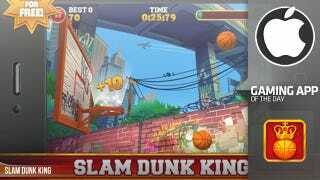 Slam Dunk King is a simple game; balls fly into the air, and you have to swipe them into the ring to score. That's how basketball works, easy enough. The game gets more interesting when it stats throwing bombs along with the balls, which instead of being swiped into the hoop must be swatted away from it, and when it starts introducing Tony Hawk-like combo and trick moves to your dunks. The game is covered in PikPok's trademark stylish presentation, vibrant court backgrounds complemented with some great characters and special attacks that look like they came straight out of Marvel vs Capcom. PikPok should also be applauded for its use of a free-to-play model in this game. While in other titles that's simply an excuse to withhold content or nickel-and-dime consumers, in Slam Dunk King you're given free access to all game modes (though some must be unlocked the old-fashioned way, through play), the only things there to be paid for being extra characters and the ability to turn ads off. Oh, and did I mention it has a great soundtrack? It has a great soundtrack, courtesy of Olmecha Supreme.